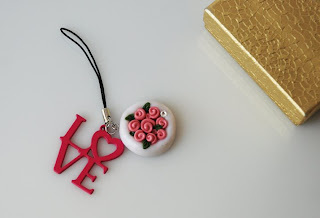 Darci is a self taught polymer clay artist that's been sculpting with clay for over 15 years. 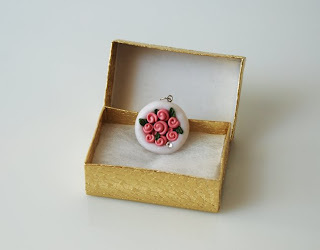 She hosted a May Giveaway for a Radiant Rosette Pendant over at her blog, Clay Bunny Creations. May was definitely a lucky month for me because I won the pendant! I received it in the mail shortly thereafter and I was surprised at the itty bitty details that she was able to craft together. I loved that she added a sparkling stone off to the bottom side! I knew I was going to give the charm to my mom because she loves flowers, her favorite color is pink and it was SO her. But I hadn't figured out what to put it on... a necklace? a charm bracelette? Finally, the week my sister came up to visit, we found a cellphone charm with "LOVE" in the same color and I instantly knew that I was going to put those together. Voila! :D She got it this past weekend and LOVED it! Check out her Etsy shop for cute one of a kind clay creations!